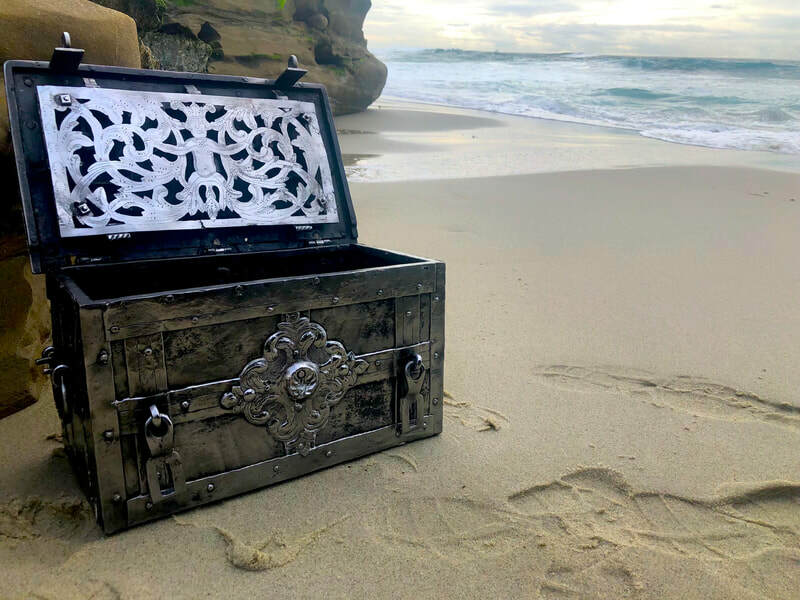 This ARMADA CHEST & Keys were hand forged in Nuremberg Germany weighs approx. 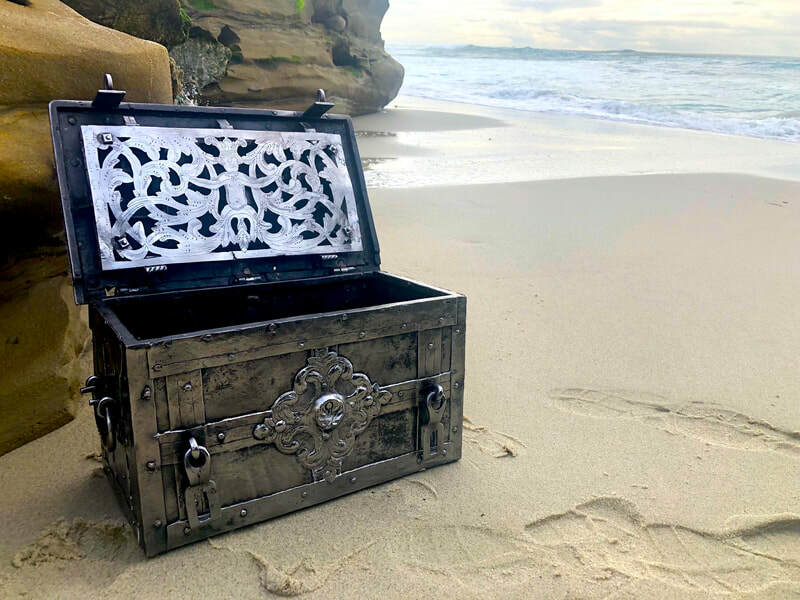 20 lbs (9.072kg) and measures 18” W x 9.25” H x 10.5"D. It also has been engraved / struck on the inside lid ~ escutcheon plate with an Ornate Native intricately woven in the Engraved design. The front “Lock Plate” is a False Lock! 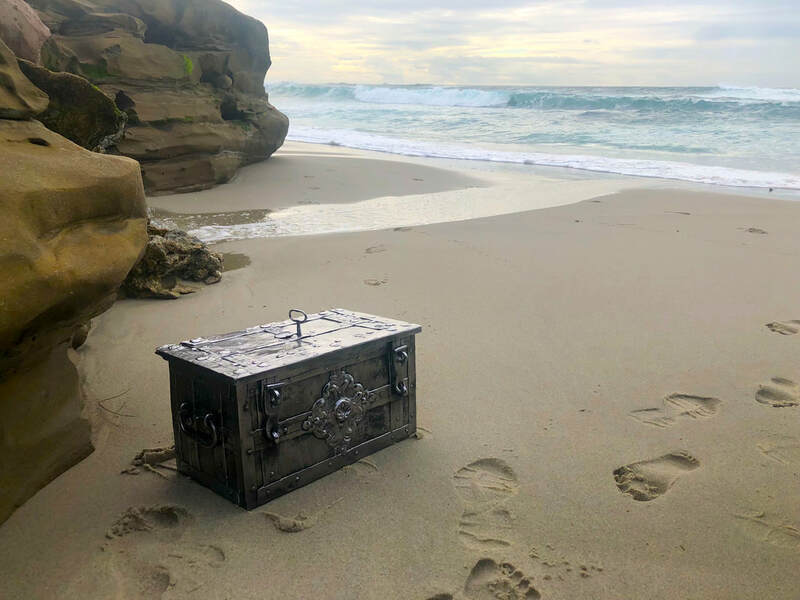 All Chests were painted in order to seal and prevent rust, this particular piece was prepared for a Museum back to it’s original state when the Blacksmith would of finished with it. It has the wrought Iron Straps and extra Locking Hasps on the front (extra protection for this Strong Box). Also wrought iron handles are on each side as well. 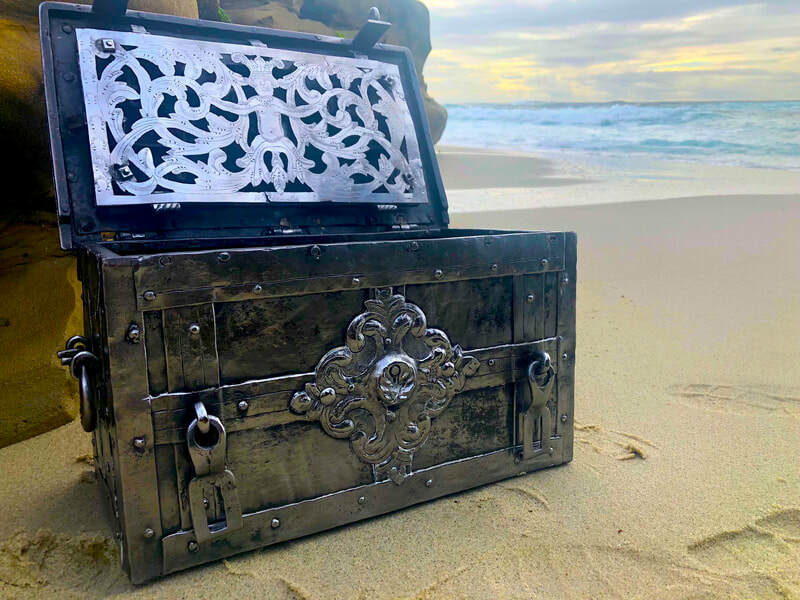 The true Keyhole is on Top of the chest hidden away by a sliding, matching, metal cover. Inside the lids are the Locking mechanisms – full 5 Pin Locking Bolts, in 3 directions. 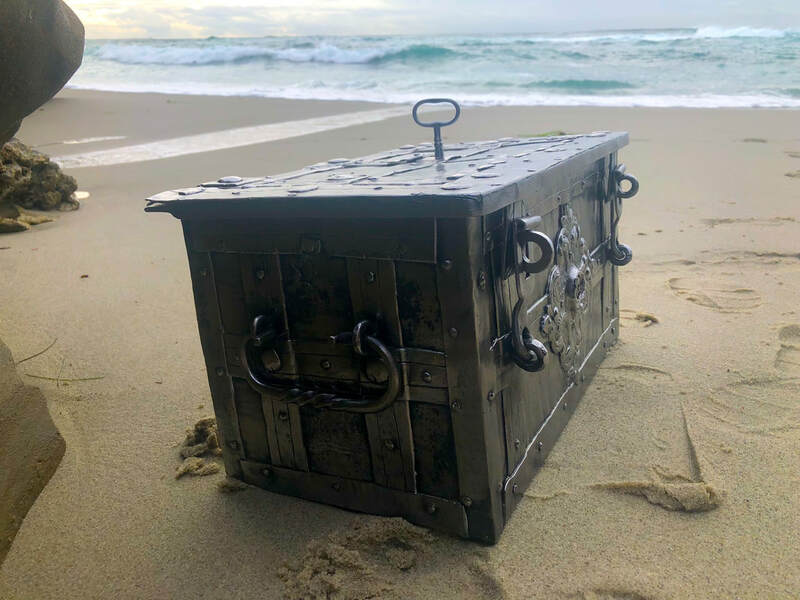 This particular Treasure Chest has a Master CHEST Key and also a Key to the Original Padlock, as well as (2) Anchor Bolts. 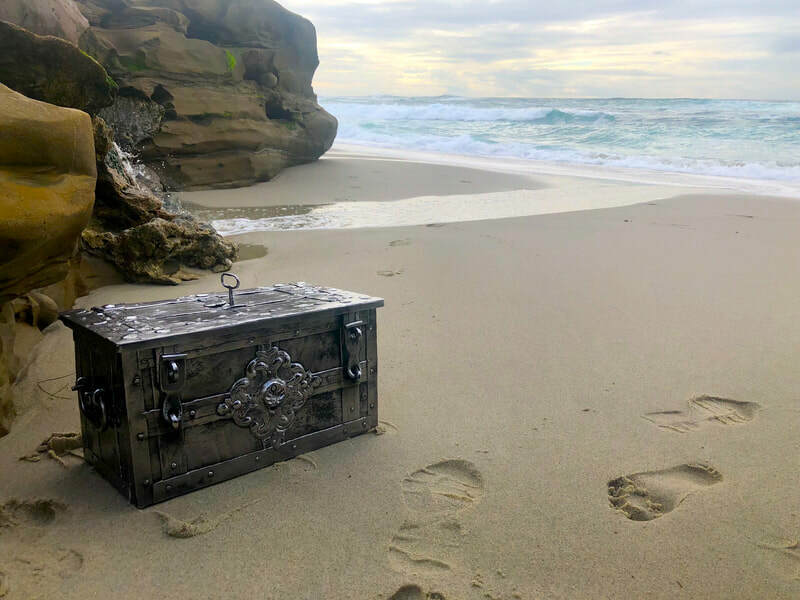 These Treasure Chests, used to carry: Pirate Booty, Soldier wages, Precious Jewels of Royalty, Tariffs, Royal Taxes, Gold & Silver Coins and Bars! Built by the same blacksmiths that created Arms and Armory. Struck and forged, these CHESTS were in the 1500 and 1600’s ~ Out of Sheet iron with reinforced intersecting straps and fittings of Iron. These highly skilled Blacksmiths worked in Germany, Austria and France. These Master Blacksmiths, from the late 1400’s, were renowned for their craftsmanship, especially in Germany, Austria and Switzerland. These shops were usually old family businesses in which younger generations were trained by their elders. 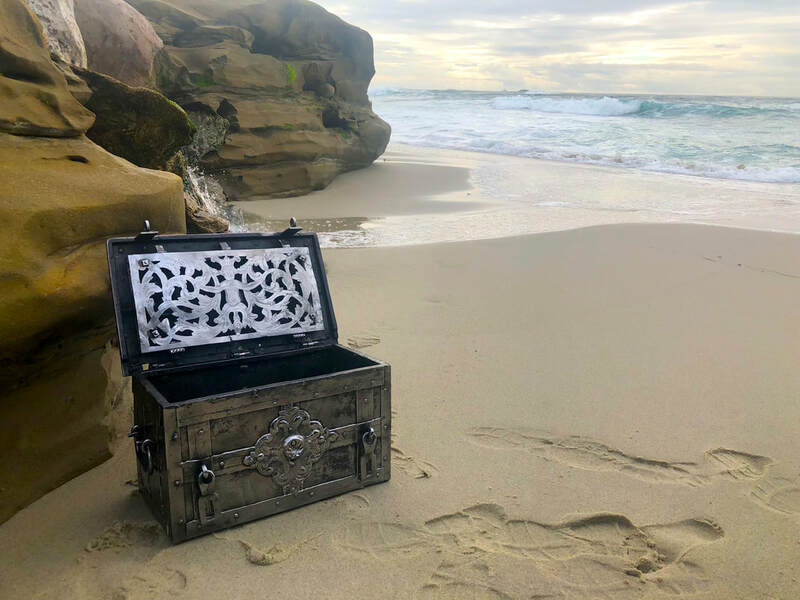 These highly skilled Blacksmiths excelled in Metalworking, hammered inlay, etching, steel plating engraving, Painting and of course rust proofing. By the dawn of the Renaissance they had achieved a dominant position in Europe. The Blacksmiths and their skills were in high demand throughout Europe and beyond.